And, Coach Chuck Parker helped. The Yellow Jackets set a mark that had never been achieved and since not duplicated with a perfect score at the 3A state meet. They downed Eastside to capture the title. Twenty five years later, Parker, who is in his 33rd year at T.L. Hanna and serving currently as a volunteer coach, can't help but to reminisce about the extraordinary performance on that day at Fort Jackson. "Obviously we had a very good team," Parker said. "It was almost like a perfect storm. The only injury we had was a girl rolled her ankle before one of our meets, and I held her out. That was it. The girls just trained their tails off and did what we asked of them." Parker began his high school coaching career in1972 at Stall. He went on to the collegiate ranks at The Citadel and then Baptist College, which is now known as Charleston Southern. 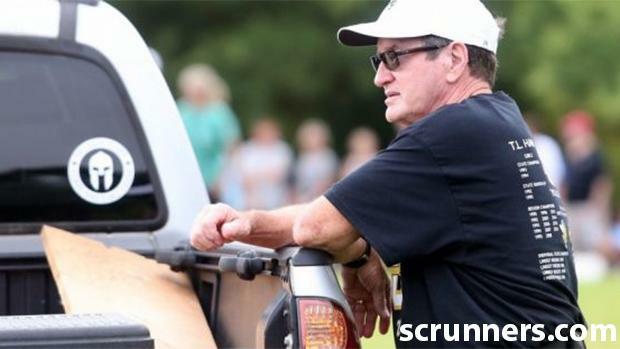 He came to T.L Hanna as an assistant football and girls track and field coach in1986. He started the girls cross country program at the school in 1987. Now retired, Parker teaches part-time at Anderson University. Parker was a four-sport athlete at Buford High School, which included track and field. Parker said the team that achieved perfection at the state meet worked its way to the top. "I think I took five (runners) to the state meet our first year," he said. "We started making our first run in four years. We won the region championship in either 1990 or '91. We were state runners-up against Chapin, and then the next year was our perfect score team. Most of the girls were really young and in middle school when we started out. When they got older and became sophomores and juniors, they really were coming into their own." One of the runners on the silver anniversary team was Brantley Epps (Isom), who was in her junior year at the time. She is currently a third grade teacher in Anderson County School District Five and has two children. Isom recalls the team being very close knit. "I wasn't the top runner, but I remember it was an amazing team," she said. "Coach Parker was like a second dad for us. He's like an elephant because he remembers everything. We just all were together and pushed each other." Isom said that it's a proud moment in her life to be a part of a perfect team. "It was such a proud and humbling moment," she said. "I don't think that I realized the impact at the time. It was such a great honor. I'm very thankful that I did sports. As a teacher, I try to help my kids find what they love to do and encourage them." Parker said that his '93 team also achieved perfection at the region meet and had a nearly flawless season. The Yellow Jackets only loss was at the Furman Invitational. However, a highlight was taking the team title at the Wendy's Invitational. Parker credited runners including Isom, as well as Lindsey Rogers and Erin Fleming. Rogers won individual medalist at the '93 meet and went on to become a championship runner in the Southeastern Conference at Auburn. Fleming finished as runner-up in the meet. Parker said that he felt confident that his team could make history going into the state meet. "Our girls were so used to winning that they just took it for granted," he said. "That one year we had 43 runners and probably had the top one through 43 runners in the state. I felt like there was an outside chance we could perfect score at state. I didn't say anything to them until the night before... When they realized they had a chance, they ran a controlled race. I called them my shake and bake team because I felt like I could shake them all up and roll them out and any one of them could finish first. That year we were fortunate to be one through five." Parker said the girls weren't interested in receiving rings for their achievement of a perfect score at a state championship. They were just satisfied to finish on top. "They were excited that they were the state champions," he said. "I don't think they realized how unique it was to be perfect. I was extremely proud of them that's for sure. We were really good that year. It wasn't great coaching or anything. Anybody could have coached those girls. I was just a quality coach, and the girls just bought into it."